I thought about something that I've been doing for years well at least an aspect of it. Before we get to that, conventional wisdom has it that if you lock the dead bolt on your exterior door which can only be locked from the outside then you definitely won't forget your keys providing you had the wherewithal of keeping the house keys in your hand on the way out. That way you'll never lock yourself out. And when I take the elevator downstairs to check my mail in the lobby and plan to be right back, I just lock the door knob and leave the deadbolt unlocked. However, when you're leaving for the day, is it necessary to also lock the door knob too along with the dead bolt? If people can break through the dead bolt, the less stronger door knob's lock won't keep them out either. What I'm getting at is that when you return home, you have to unlock both locks instead of only the dead bolt. Two locks instead of one. Yeah the same key operates the tumblers on both my door knob's lock and the dead bolt but still it seems like an unnecessary step. The door knob's lock doesn't really provide a second level of security. I was selecting an apple in the fruits and vegetables section in the grocery store and another shopper came by and asked if the apples were guud. Only 99¢ per pound which is the equivalent of paying $2 for gasoline in Hawaii fresh fruit prices. However some kind of off-variety apple that I had never heard off before. To my fellow shopper's good fortune I had done my research. The night before I bought a single apple and had returned to the orchard to pick a bunch of apples from the same tree. The apples passed the taste test, so to speak. So I related the story to the shopper that I had purchased a single apple the night before and it's indeed worth buying, etc. etc. Then to beleaguer the point our shopper asks, "are the reds better?" Meaning the apples with more red skin on them. Ask Steve Jobs about apples already. Hey, I just divulged some pretty privileged info to you so without saying a word I made my leave. Was the person a product tester for the grocery store? Or, perhaps the grower himself? We'll never know that. 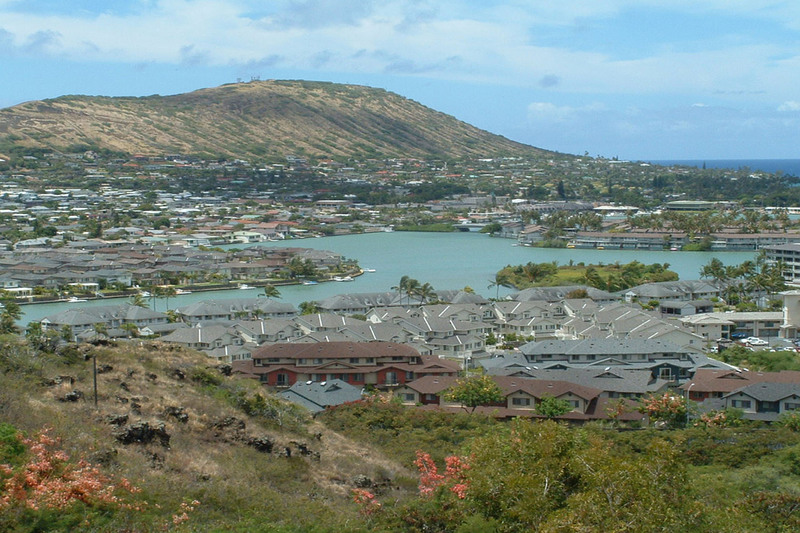 Two men caught trying to steal downed street light pole. The thieves had already cut up the aluminum pole and had the pieces in the bed of their pickup truck when they were arrested at the scene. The state Department of Transportation said the light pole was previously knocked down in a car crash and was sitting on the side of the road until crews could return to the scene and make repairs. DOT spokesperson said that the pole weighed 150 lbs. He says if the suspects wanted to re-sell the aluminum, they would have received about $70. On my way home I stopped by the Costco in Hawaii Kai, and there wasn't too much of a line at the Costco food booth much to my delight. 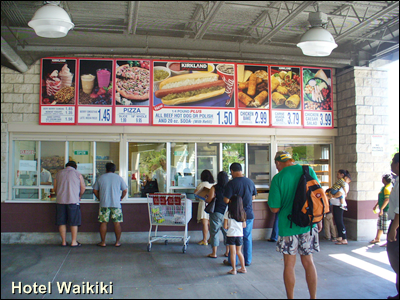 The food booth at the Honolulu Costco always has a long line any time of the day and that's even with 4 or 5 counters open. What a break. 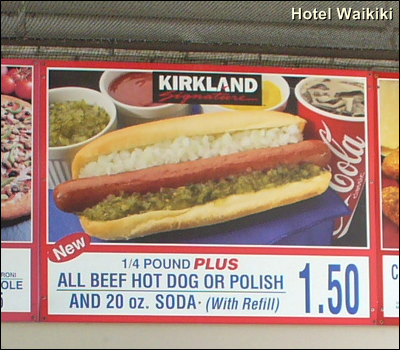 Moreso since I usually just buy the $1.50 Polish hot dog with sauerkraut and won't spend a nickel more. Well, tax is 6¢ but that don't count. This lady carrying her two-year-old at the next counter had place her food order and the counter had closed. Her's would be the final order and they'll call her when things were ready. While she's stepped to the side, the cashier at our counter went, "Can I help you?" The lady explains that they're preparing her order. But the cashier, who I think was overzealous, almost demands that the customer divulge what was ordered so she can check on the order for the customer's sake whom doesn't even mind waiting without the undue badgering puleeze, or what, peril waterboarding. If you're wondering, I wasn't eavesdropping in on their conversation. It's just that I'm standing right behind them in earshot range. So the customer politely tells Mrs. Over Zealous Cashier what she had ordered, and the cashier goes and checks to see if the order is ready. Sure enough, the order isn't ready just yet, just like the customer said from the get go. And like I was saying, it ain't like there were 500 million people standing in line that service needs to be streamlined to speed things up unless there's a craving for an artificial rush in a bozo cashier's mind who couldn't do a decent rendition of a Jerry Seinfeld food nazi to save her okole on a good day. When everybody else is in a Sunday frame of mind, on a Sunday, no less, it makes you wonder what's going on up there.